The HP-18C was a business calculator with a new folding design and a dedicated alphabetic keyboard. It was HP's first algebraic pocket calculator. 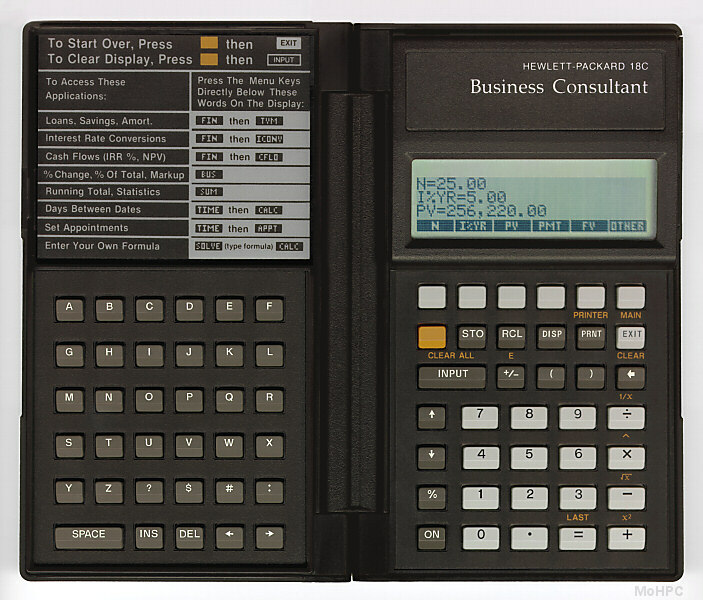 (HP previously used algebraic logic on desktop calculators, portable and desktop computers, and the HP-01 calculator watch.) Besides the basic business features of time value of money, cash flows etc., it had a clock with appointments, and a very powerful equation solver. It had 4 numbered registers, plus named lists. The HP-18C was also the first calculator to be programmed by HP in the new RPL language and it is listed in the RPL family here because of this, however, this language was not made available to users of the calculator. The calculator was based on a Saturn architecture CPU. Though it was an algebraic machine, it had a four level "history stack" with roll up and roll down keys. The LAST key retrieved the value on the next level of the stack into the current expression. HP learned in focus groups that most business calculator customers disliked keyboards with many labels and shift keys. HP responded by providing twice as many keys and also soft keys. For the first time, soft keys were labeled by the calculator itself using the high-resolution dot-matrix display rather than using cards or overlays. This allowed the calculator to provide a menu system for the majority of the advanced functions. Most of the calculator's capabilities were accessed by a single MAIN key that displayed the top menu. Two kinds of solvers existed on earlier HP calculators. The first type was the dedicated Time Value of Money (TVM) solver that first appeared on the HP-80. This was a very easy to use solver that allowed the user to specify the known values of TVM problems and solve for unknowns. For each known value, the user entered the number and then pressed the corresponding key (N, I, PMT, PV or FV). For unknowns, the corresponding key was pressed without first pressing a number. The second kind of solver was the root finder. This first appeared as software for early HP scientific calculators and then was later built-in to models such as the HP-34C. These solvers were much more flexible than TVM solvers because they could solve any equation but they were not nearly as easy to use. In order to solve an equation, the user was required to manually isolate the unknown variable and enter an appropriate function to solve for it. The HP-18C introduced a powerful new solver which was as easy to use as a TVM solver yet could solve arbitrary equations like a root finder. The calculator automatically performed the task of isolating the variable to solve for. When equations were entered, the solver automatically showed their variables on soft-keys. The solver worked by first attempting algebraic manipulation on the equation to isolate the unknown variable. If this was successful, it calculated and displayed the result. If the isolation method failed, it used an iterative numerical approach. The number of equations and the number of variables was limited only by total memory. Each equation was added to a list so to use an older equation, the user simply scrolled to it. The solver provided all the functions of the calculator for defining equations plus a few more features, such as conditionals which were embedded in expressions like: IF(conditional_expression:true_expression:false_expression). This was the first model to offer infrared printing. This saved the user from having to deal with wires and connectors and was probably more reliable in the long term than tiny connectors.